Small companies in niche markets can use their specialization and nimbleness as powerful competitive advantages. For most tech entrepreneurs, it's an "Oh, sh*t!" moment when Google, Amazon or Apple enters their market space. These giant companies have more money, more people and more room for error than any startup. "Yes, the Googles and Apples and Amazons of this world can probably destroy you if they really wanted to." "They will out muscle, out smart [sic] and ultimately just outspend you." "If Google decides to compete with your startup, it’s already too late for you." Many contributors seemed hopeful that if you built sophisticated enough technology, Google would acquire your startup instead of offing it. Still others came up with detailed “If ___, then ___” advice on navigating this situation. The question is an old favorite of venture capital investors. At its heart, it's a hypothetical scenario to test how founders think. I took the real-life version of the pop quiz when both Google and Adobe entered my company’s form-builder market. Educate the market (or let your competitor do it for you). Some background: I launched JotForm in 2006 before form builders were "a thing." Google launched Google Forms in 2008. Adobe came out with FormsCentral in 2012 (and retired it in 2015 for reasons I’ll explain later). Logic says two tech giants should smash a bootstrapped startup if everyone's competing for the same customers. In reality, Google and Adobe didn’t hurt our business at all. They helped. How? They educated the market about form builders. In 2006, virtually no one knew or cared what a form builder was. As a small company, we had no power to raise broad awareness. But when Google came out with Google Forms, Google Drive users discovered they could build forms. Google’s investment in Google Forms taught the world about the problems our product aims to solve. Google Forms was (and still is) free, but it’s extremely basic. People who discover Google Forms and put it to use often realize they need more advanced features such as conditional logic or customized emails. When they search for competitors, they find JotForm. Google Forms helps the form-builder industry by introducing millions of people to the idea that anybody can make online forms. Why, you might ask, didn’t Google just decide to “destroy” or “outspend” us as Quora's commentators suggested? The form-builder market is microscopic from the perspective of a Fortune 100 company. Had Google spent the money to build a better product than JotForm, it wouldn’t have paid off. Adobe learned this lesson the hard way with its FormsCentral product. Unlike Google Forms, it was a freemium service. Adobe announced its retirement in 2015, stating “… there hasn’t been as much demand for this type of service as we anticipated.” For a company Adobe's size, the revenues simply weren’t worth the expense and effort. We dropped everything and spent four months building an import wizard for FormsCentral. Users entered their FormsCentral information, and the wizard automatically migrated all their data to JotForm. 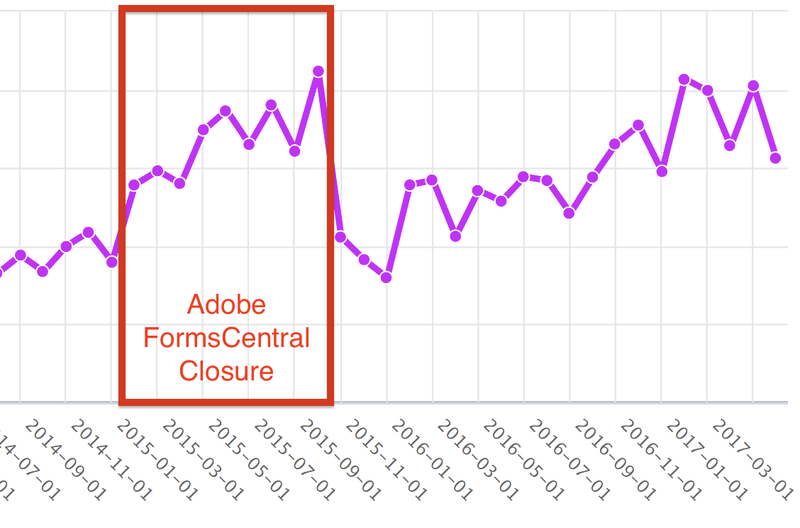 We’ve imported nearly 116,000 forms and more than 4.3 million form responses from Adobe. In other words, Adobe spent who-knows-how-much money on innovation and introduced the idea of “form builder” to all Adobe customers -- only to send customers to us. Thanks, guys. Adobe notified customers six months prior to the closure. The chart below shows how that development affected JotForm’s monthly new-business revenue. Both competition scenarios worked in JotForm’s favor. Our market is too important to ignore but too small to satiate a hungry tech giant. They need Costco-sized portions, whereas we can get our fill at the farmer’s market. Truthfully, the tougher scenario would be fighting off a small, sophisticated, nothing-to-lose competitor with everything to gain. Our experience with Google and Adobe is one isolated case. We benefited from the competition because we’re in a market tangential to their core competencies. If you do attempt to compete with tech behemoths at their moneymaker, brace yourself. They may, in fact, destroy you. Unless you have an unfair competitive advantage, don’t try to go head-to-head on search with Google or on graphic-design software. Some participants in the Quora dialogue seemed optimistic that Google would acquire your startup if you competed with their core technology. In most cases, I think that’s wishful thinking. It’s often cheaper for companies to reverse-engineer your technology than buy it -- if they care enough to do either one. If you're so good a much larger company needs to acquire you, it actually might make sense to stick to your guns instead of exiting too early. Many years ago, we received a similar offer from a large company in Silicon Valley. We decided to go it alone. And I'm glad we made that decision. JotForm has become more successful than I'd ever imagined. I don’t disagree with realists: If Google dedicated 200 people to blowing JotForm out of the water, they could do it. Part of our job is to make that as unappetizing as possible. Let me explain how with an analogy: Imagine you're 5 feet tall and being chased by a musclebound 7-footer. Wouldn’t you make it as difficult as possible? You’d run up stairways instead of down. You’d crawl through tight spaces. You’d never stop moving. You can apply the same strategy to business. All you must do is convince the behemoth that chasing you isn’t worth it. Do one thing so well, so thoroughly and so obsessively that the idea of following you makes the monster feel hopeless. If he still chases you into in a niche space, don’t fret. Thank the behemoth for educating the market and take his customers. It worked well enough for my company.